I can't find a QR Code? Participating Retailers? Some retailers are unabel to display a QR Code in their store, however we will honour any purchase. Please feel free to visit the Centre Management Office during office hours of 8.30am to 5.30pm where we have a QR Code and recognise your purchase/s from any store within Sunnybank Hills Shoppingtown. Some retailers include ALDI and Kmart. Please see Terms & Conditions located inside the App for full information. If you wish to report missing points, a fault or any feedback regarding the app please contact or visit Centre Management or complete this form. Centre Visit: every time you visit Sunnybank Hills Shoppingtown your account will automatically be allocated 5 points (once per day). Retailer purchase: every time you spend at a participating retailer, you are allocated 10 points regardless of the purchase amount. You need to scan that retailers exclusive QR barcode to get the points allocated to your account (make sure you ask the retailer for their barcode if they don’t offer it to you). You can only receive one point allocation, per retailer, per day. To receive the 5 entry points per visit, you must have the app open and be logged in. Your Bluetooth and location services must also be turned on inside the App. You can find these under Settings/Permissions. Prizes – search under the ‘Redeem’ button on your app to check out all the free stuff on offer. A current list can be viewed on our Prizes & Offers page. Retailer Deals & Offers – use the ‘Deals’ button to view the latest deals from our retailers. Some cost you points and some are free. A current list can be view on our Prizes & Offers page. Exclusive competition – use your points to enter our regular competitions, and keep an eye on the ‘Competitions’ tab on the app for other exclusive competitions and games. How often do the Prizes/Offers Change/ Get updated? This will depend on the prize or offer, but generally each prize and offer will have a limited quantity or used by date which will dictate when the prize/offer is changed or removed. How do I check the balance of my Points? 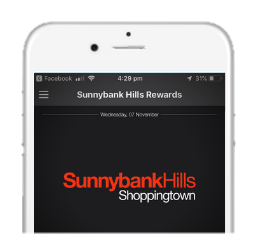 Your points will be shown on the home page of the Sunnybank Hills Rewards app on your phone. They will also be shown each time you go to redeem a prize or offer. What phone do I need for the App to work? Android devices with Android version 4.0 or later. iPhones with either iOS7 or later. I do not have a mobile phone/ I do not have a phone which is supported by the scheme. How can I participate? Unfortunately, the Sunnybank Hills Rewards program is only available to customers with a supported smart phone. There may be some smart phones that are not compatible with the Sunnybank Hills Rewards program, however we are continually monitoring and updating the list of compatible devices. What happens to my points if I change my phone? The app is transferable across to your new device in the same way other apps transfer over. Simply login with using your details and all user information will appear on the new device. Every Sunnybank Hills Shoppingtown customer over the age of 15 years is eligible to participate in the scheme, providing they have a compatible smart phone. Sunnybank Hills Shoppingtown retail staff, contractors and immediate family are not eligible to participate. I forgot to show my phone at point of sale/ my phone battery died. How can I collect my points? Generally, points cannot be collected after your purchase however in exceptional circumstances, a customer may be able to receive their point’s allocation by bringing the relevant receipt to Centre Management. If I get a refund on the purchase I've made whilst collecting the points? Do I get my points deducted? No. Refunds do not affect collection of points. Please see T&Cs for more information. I have made multiple Purchases in the same retailer on the same day. Do I qualify for more than ten points? No. You may only collect 1x ten point allocation per transaction per retailer per day. I want to leave the loyalty program? To leave the program simply delete the app from your mobile phone and unsubscribe from the Sunnybank Hills Rewards emails.